The following is the text of the Maya Flood Myth as recorded in Temple XIX at Palenque. It is presented in Mayan as well as English. 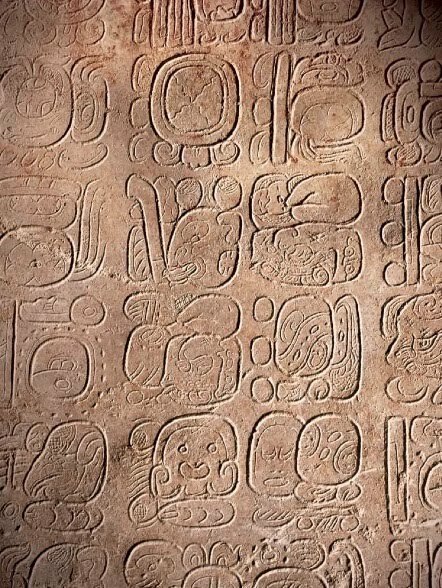 The question marks in the Mayan version show where Mayan scholars still have some uncertainty in regards to the proper interpretation of the glyphs. In Mayan: " Ju'n Etz'nab(?) Wak Yaxk'in cha[h]ka[j] ub'aah Way(?) Paat Ahiin(? ), Tz'i[h]b'al Paat Ahiin(? ); ux [...]waj u ch'i ch'[e]l nak[...]waj, joch'k'a[h]k'aj; i patlaj yeb'tej(?) Ju'n [.........]"
In English: "[On] 1 Etz'nab' 6 Yaxk'in the head of "Hole-Backed Caiman" [(Way(?) Paat Ahiin(? )], "Painted-Back Caiman" [Tz'ihb'al Paat Ahiin(? )], was cut; copiously flowed the blood of the one who raises the stream(? ), the one who drills the fire; then the work of Ju'n [ ] formed it"
The 1999 discovery of the hieroglyphic platform of Temple XIX at Palenque (Stuart 2000a) opened the doors to a new understanding of Classic Maya mythology. Dedicated during the reign of K’inich Ahkal Mo’ Nahb’ III2 in AD 734, it begins with an account of a series of cosmic events that occurred during the final bak’tun of the previous creation. These events include the enthronement of god GI in the sky under the supervision of Yax Naah Itzamnaaj on March 10, 3309 BC, as well as a decapitation event that happened eleven years later. This passage (Figure 1), partially deciphered thanks to contributions made by David Stuart (2000a:29, 2005:68-77, 176-180, 2006:101), narrates the decapitation of a crocodile or caiman with star and deer attributes (the “Starry Deer Crocodile”), that we can observe in other contexts as a patron god of the month Yax,3 the head variant of the eighth day of the Maya calendar, Lamat, or the personification of the glyph for “star,” “Venus,” or “planet,” EK’ (see Förstemann 1906:182-196; Thomp- son 1960:77, 105, 220-221; Kelley and Kerr 1974:184; Kelley 1976:38; Closs 1979:147-148; Aveni 1991:316). The text of the platform of Temple XIX seems to refer to this crocodile as Way(?) Paat Ahiin(? ), Tz’ihb’al Paat Ahiin(? ), “Hole(? )-Backed Caiman(? ), Painted-Back Caiman(? ),” an interpretation suggest- ed by Stuart (2005:70), who proposed that the logo- gram of the seated and hunched male figure (T227) could be read as PAT (paat), “back.” This proposal is suggestively supported by Stela 16 from Dos Pilas and Stela 2 from Aguateca (Figure 2), dedicated in AD 736, only two years after the platform of Tem- ple XIX at Palenque. While this last inscription re- fers to the decapitation of a “caiman with a painted back,” the collocations on the Dos Pilas (D2-C3) and Aguateca (D1-C2) stelae apparently describe a cut- ting act performed over a “decorated-back K’awiil,” an event that took place under the reign of Dos Pilas Ruler 3. The resemblance, chronological proximity of the passages, and the syllabic spelling of the word paat (pa-ti) (Figure 2b, c), reinforces the suspicion of a presumed PAT reading for the hunching man logogram. According to Stuart (2005:74-75), there are some cai- man depictions that carry underground holes or cavi- ties on their backs, which could illustrate the concept of Way(?) Paat Ahiin(? ), “Hole(? )-Backed Caiman(? ),” mentioned on the platform of Temple XIX. Although the phrase Way(?) Paat Ahiin(? ), Tz’ihb’al Paat Ahiin(?) appears to be ambiguous, as it is not clear if it refers to two different saurians or to a single entity being de- scribed with parallel couplet-structure phrases (Stuart 2005:69-70, 176, 2006:101), at present I am somewhat more inclined to favor the second of these options, by virtue of the syntactic parallelism attested in Maya hi- eroglyphic literature (Bricker 2000:106-110; Lacadena n.d.:5-6), as well as by the fact that later written sources (see below) support the idea of the decapitated caiman as only a single entity. On a more general level, the Starry Deer Crocodile is probably a depiction of the underworld sky, the night firmament, or a symbol of the night (Wagner 2001:287; Stuart 2005:72-73), just as it is manifested on the famous Cosmic Plate (Figure 3), where several stars hang from the saurian’s body, whose curvature constitutes the up- per rim of the scene. In Stuart’s view (Stuart, 2005:70- 71), the Starry Deer Crocodile “is a variation or aspect of the ‘Celestial Monster’” or “Cosmic Serpent” entity that was first identified by Herbert J. Spinden in 1913 (see Spinden 1975:53-56). In a number of examples dating to the Classic period (Figure 4), we notice that both crocodile or caiman heads vomit a torrential liquid decorated with conch shells, jade beads, small bones, rows of dots, comple- tion signs, and K’AN and YAX logograms. As previ- ously demonstrated by Stuart (1988, see also Schele 1985:37; Schele and Miller 1986:48), the relationship be- tween these elements is associated with the symbolism of blood, as can be observed in depictions of quatre- foil bloodletters (Figure 5) that are held in the hands of Maya rulers. The image of a celestial caiman pouring blood (Figure 4) suggests a flood or torrential rain, as can be confirmed by a hieroglyphic passage written on the platform of Temple XIX (Figure 1) which seems to refer to a deluge of blood. Similar to this last example is the expression joch’ka[h]k’aj (Figure 6d), “the person who drills the fire.” Although the identity of this individual is not explicitly mentioned, it is worth observing that “drill- ing the fire” is a ceremony that usually follows the de- struction of the world by a deluge, as referenced in the mythological sources of highland Mexico.8 In this case, because it constitutes an indirect allusion to the Starry Deer Crocodile, the fact that this caiman was a sym- bol of cosmic destruction and renewal is emphasized. Maybe because of that, “the person who drills the fire” is immediately followed by the phrase i patlaj “and then it was formed” (F6), an event that according to Stuart (2000a:29, 2005:68, 180, 2006:101), describes the “creation of a new cosmological order,” overseen by the god GI,9 who also seems to be the agent who decapitates the caiman that spilled its blood (Stuart 2000a:29, 2005:177, 2006:101). In this light, the whole passage of Temple XIX al- ludes to a process of destruction, creation, and renewal of the universe, initiated by the decapitation of a celes- tial caiman on the sacrificial date 1 Etz’nab’, which in turn caused a deluge of blood. This blood could also be linked to the sacred liquid of dynastic succession, as mentioned on Stelae 6, 11, 14, 25, and 33 from Pie- dras Negras (Figure 8), where the accession ceremony of the kings is presented as an act of cosmic relevance which includes the flooding of blood, the sacrifice of a victim, and the rebirth of a lord in his new condition as ruler, an act of destruction and creation of a new politi- cal order (see Proskouriakoff 1960:455; Stuart 1988:195; Taube 1988:340-350, 1994:671-674). For the Yukatek Maya, the flooding was caused by Ajmuken Kab’ (“He Who is Buried Underneath the Earth”) and by the B’olon ti’ K’uh (“The Nine Gods”), telluric forces that outraged the thirteen gods of heaven and robbed them of their insignia (Roys 1967:99-100). As a consequence of this, the sky fell and, according to Landa (in Tozzer 1975:135-136), the four B’aah Kab’ es- caped the destruction. Maybe because of this, the word B’aah Kaab’ is written on page 74 of the Dresden Codex (Figure 9),14 a passage traditionally interpreted as the destruction of the world caused by a flood (Thomp- son 1993:214-216; Davoust 1997:256-257; Schele and Grube 1997:198-199). In this scene we observe that the old Goddess O—Chaahk Chak Chel—is pouring out the destructive waters that she carries in a jar,15 while a black-painted God L holds his weapons over the sur- face of the earth while wielding a long staff. Streams of water descend from the jaws of a pluvial caiman and from a pair of eclipse glyphs that it carries below its body. According to Karl Taube (1995:72), the ex- pressions “black sky” (B2: IK’-CHAN-na) and “black earth” (C2: IK’-KAB’-b’a) that appear in this scene are a possible reference to the destruction of the world. In Michael Coe’s (1973:14) opinion, this topic was picked up on page 32a of the Madrid Codex (Figure 10), where another black deity, which has been identified as Zimmerman’s God Z (Zimmermann 1956:164; Bricker 1997:21; Sotelo Santos 2002:165-166; Hernández and Bricker 2004:295-296), appears holding his weapons under a sky band from which rain is pouring. We no-tice that the god grasps a spear, two darts, a shield, and a spearthrower.16 A snake, which probably represents lightning (see Taube, 1997:19-22; Miller and Taube 1997:106), seems to tear a hole in the celestial band. As on Dresden Codex page 74, we find eclipse signs that hang from the band. Underneath the scene in the Madrid (M32b) there is an image of the goddess Chak Chel, between whose open legs a stream of water is pouring, which corresponds perhaps to the destructive liquid that the goddess pours on Dresden page 74 (De la Garza 1984:232-234). It is well known that the scene of the flood precedes the New Year pages of the Dresden Codex (pp. 25-28), where amongst other ceremonies, the erection of trees in the four corners of the world can be observed. As noted by Taube (1995:72-73), the account of the flood also precedes the New Year ceremonies in Landa’s Rel- ación and the cosmological myth about the erection of world trees in the Chilam Balam books of Chumayel, Maní, and Tizimin, which confirms the basic idea ex- pressed on the platform of Temple XIX of Palenque, in the sense that the flooding unleashed a process of cos- mic destruction and renewal. sage contained in the Chilam Balam books of Tizimín and Maní can help us to understand the relationship between the flood, the decapitation of the cosmic cai- man, and the construction of a new cosmological order, as expressed on the platform of Temple XIX at Palenque (Figure 1). In this inscription, the decapitation of the caiman with the painted back took place on a 1 Etz’nab’ date. The manner in which these concepts persisted through time can be exemplified in a mural painting from Structure 44 at Tancah (Figure 11). It represents a character (possibly God E, Lord of Maize) who holds in his right hand a logogram OL/WAJ from which a maize ear is sprouting.19 The individual depicted uses as a helmet a full-body caiman with a spotted back, on whose torso we can find the glyphs for Etz’nab’ and Ajaw, which might possibly be a reference to the day when the decapitation took place and creation began, as symbolically expressed in the medical spells from the Ritual of the Bacabs by the paired set of dates 1 Ajaw and 4 Ajaw. Comparative analysis of hieroglyphic texts, Precolum- bian images and colonial alphabetical texts has made it possible to verify the diachronic and geographical persistence of a basic core of Maya beliefs, related to the destruction of a previous world by flooding, a cata- clysm that allowed the construction of a new cosmo- logical order. Beyond this, the myth of the great flood- ing and decapitation of the caiman, documented from the eighth century in Palenque until the eighteenth in the books of Chilam Balam, had important varia- tions throughout these ten centuries. Most noticeable amongst them is probably the fact that in the Classic Maya version, the liquid being spilled by the caiman is blood, whereas in the Dresden Codex and the colonial sources that followed, the liquid can be identified as water.23 On the other hand, the eclipse that served as a preamble for the flooding does not seem to be pres- ent in the Palenque version, while the names of gods and entities that appear in all these accounts are also different. Taube (1995:70, 73) has pointed out that the myth of the decapitation and dismemberment of the Itzam Kab’ Ahiin caiman is suspiciously similar to the na- huatl version contained in the Histoyre du Mexique (Garibay 1979:108), which narrates the manner in which Tezcatlipoca and Quetzalcoatl chopped up the body of the Tlaltecuhtli monster, and with its dismembered body parts, formed the world. The data contained in the text of the platform of Temple XIX at Palenque re- veal that this is not a tradition that was recently intro- duced amongst the Maya, but that all these different versions proceed from a Mesoamerican cultural back- ground whose origins became lost somewhere in the depths of time. I wish to express my gratitude to Dr. David Stuart for having invited me to present this work at the 30th Maya Hieroglyphic Forum (on the mythology of Palenque), to Joel Skidmore for raising the possibility of having it published in The PARI Journal, and to my friend Carlos Pallán Gayol, for his invaluable help in rendering the original Spanish text in English. Through the preparation of this paper I have received many useful and encouraging comments from Maricela Ayala Falcón, Guillermo Bernal Romero, Claudia Brittenham, Nikolai Grube, Alfonso Lacadena García- Gallo, Barbara MacLeod, Simon Martin, David Stuart, María del Carmen Valverde Valdés, and Marc Zender. Without the help of each one of them, this paper could not have merrily arrived to shore, although, as is usual in works of this sort, any mistakes that may occur are the sole responsibility of its author.